Pink topaz surrounded by a diamond halo is guaranteed to sway a lady's heart and when it can be carried around on a ring, the attraction is amazing. This ring is an enticing piece fashioned from 925 sterling silver and its gracefully designed frame is enhanced with the embedding of diamonds on both sides of the ring's upper half. Positioned perfectly on top of the ring is a heart-shaped base crafted from sterling silver and also serving as a holder for the 1.70 Carat, heart-cut pink topaz gemstone. The 8mm x 8mm sized, pink gemstone looks stunning and this is further enhanced by the surrounding 0.07 Carat diamonds for that amazing halo effect with all diamonds on the ring totaling 24. 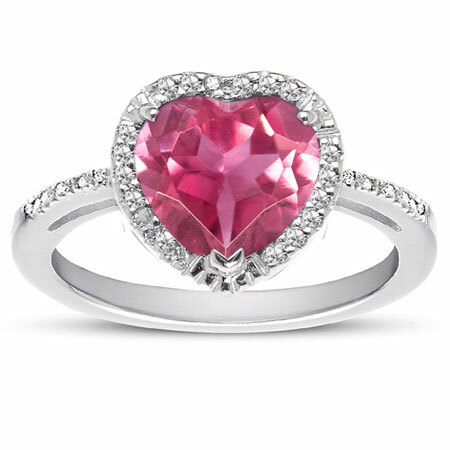 We guarantee our 1.70 Carat Heart-Shaped Pink Topaz and Diamond Halo Ring in Sterling Silver to be high quality, authentic jewelry, as described above.